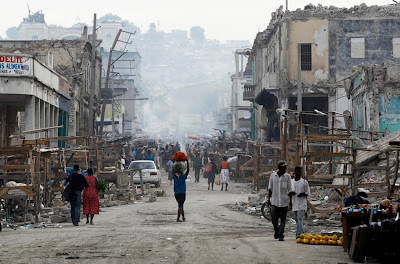 It's hard to imagine that the devastation suffered by Haiti was over a year ago. Of course I say 'was' over a year ago but the truth is that the last year has been anything but trouble free as the country tries to rebuild itself. A good friend of mine works for Concern and spoke to me recently about what they're doing in Haiti. From a digital perspective I thought it was really interesting that it’s the first time that an Irish International charity has done anything of note on Facebook so I thought it might be of interest to you folk. To mark the anniversary of the earthquake in Haiti Concern ran an awareness campaign within Facebook. Concern are the first Irish charity to harness a Facebook homepage takeover, which is driving to a custom tab on their profile. The tab acts as the landing page for visitors that have not previously ‘liked’ Concern and outlines the key areas that Concern and ECHO have been working on. In addition, within the tab they have embedded a campaign specific video that is streamed from their YouTube channel, an interactive Google map that details what has been achieved in each location Concern is working in and twitter feeds from @Concern and staff that are in the field at the moment. You may also like to take a look at this post from The Boston Globe. The images are absolutely incredible.